The property cost should factor in the property purchase price, along with additional costs like Stamp Duty, Brokerage Fees & Renovation or Maintenance Costs. Once you have the rental yield for the property you want, it’s time to compare. Most people only look at affordability or location as points of comparison without thinking too much about the return. 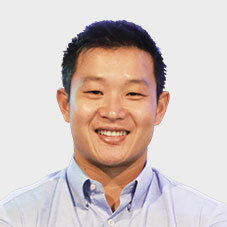 It’s a sound approach, since properties are assets that appreciate through time. On the other hand, a more serious investor would want to compare properties by their rental yields to get a better idea of how much time it would take to get the best returns out of their investment. 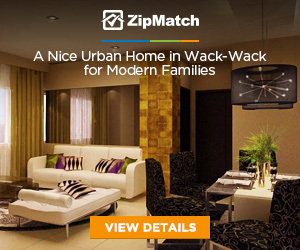 The Data Science Team at ZipMatch took a look at a year’s worth of data from 75,000 Metro Manila properties for for sale and for rent listed on its site. 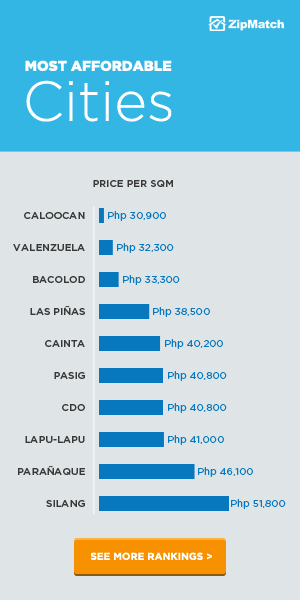 Out of this data, they were able to get the average rental yield for each city in Metro Manila. via: gross rental yield in the Asian region. 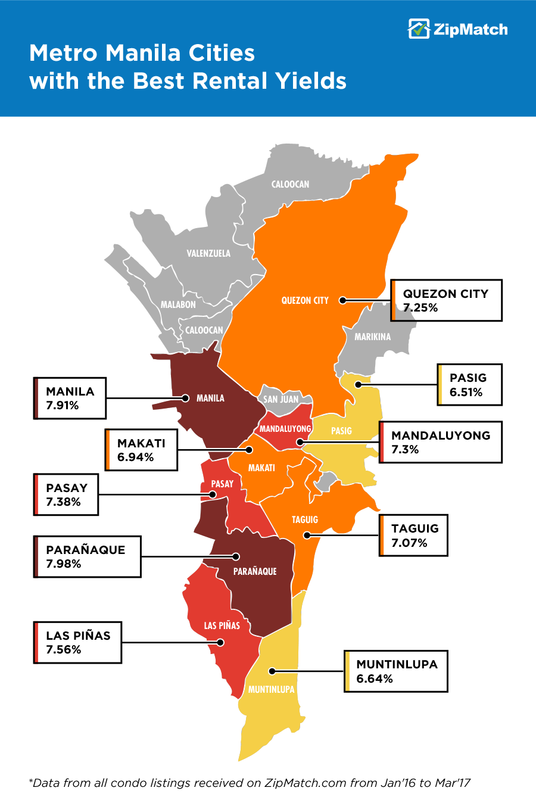 It is evident that most cities with the highest rental yields are located in the western and southern part of Metro Manila–Manila, Pasay, Parañaque and Las Piñas. 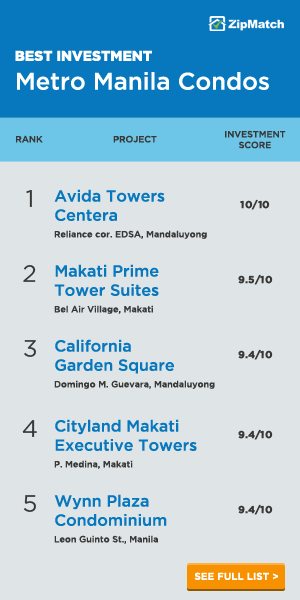 Over the past year, these cities near the coastal area of Manila Bay have surprisingly outranked the more popular business districts like Pasig, Makati, and Taguig. 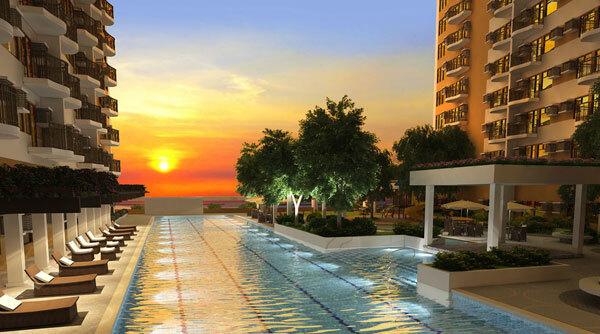 Besides the fact that popular tourist attractions can be found here such as the SM Mall of Asia, Solaire Resort and Casino, and the City of Dreams Manila, a newly constructed SkyWay exit has largely contributed to the massive growth of new condo developments. 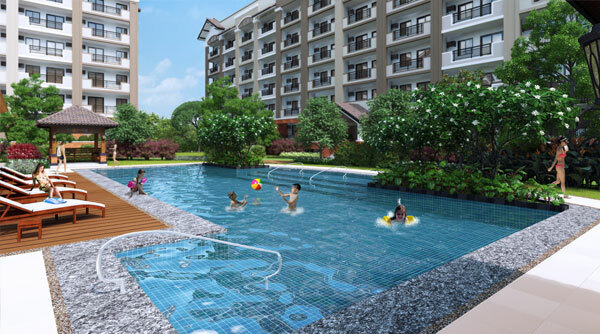 This accessibility has also added interest in Las Piñas as an affordable residential option for young professionals working in Metro Manila’s CBDs. Below is a table of the average property price and average monthly rent of cities in Metro Manila with the best rental yields. It’s interesting to note that costlier cities like Taguig and Makati provide lesser rate of rental return compared to more affordable locations. For example, when choosing between a studio unit in Makati priced at Php 4.5M and a studio unit in Manila priced at Php 2.8M, one might initially think that the former has better investment potential than the latter. 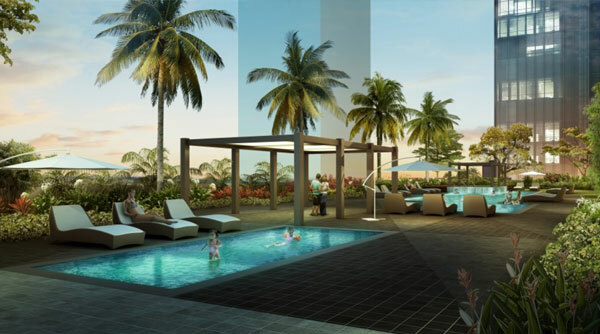 By looking at rental prices for both cities–Makati at Php 28,000 and Manila at Php 20,500, it is safe to conclude that a Manila property will provide better return on investment. 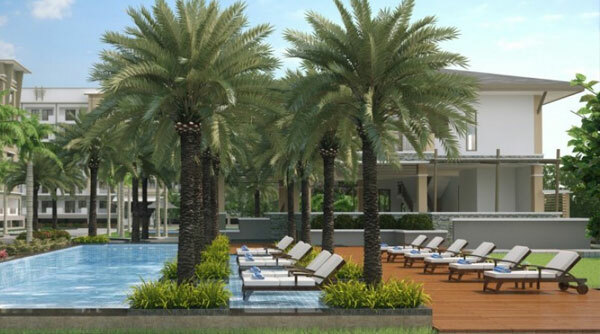 Parañaque, leads the rankings with the highest rental yield of 7.98%. It also ranks as the second most affordable city to buy property, at an average sale price of Php 1.65M for a studio unit and Php 3.4M for a 1BR. 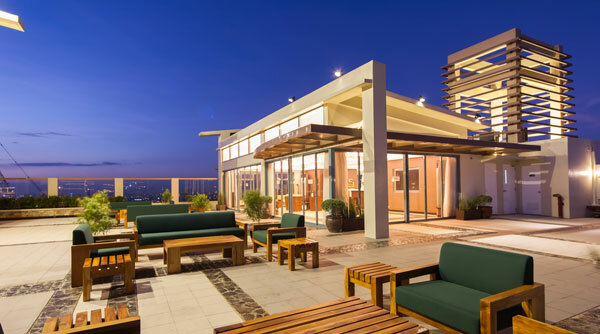 The city has a total land area of 47.28 square kilometers, and is widely known for being home to Baclaran, the Ninoy Aquino International Airport, and BF Homes Parañaque–known as the biggest subdivision in Asia. These cases demonstrate that affordability or location might provide answers on which properties would best fit a buyer’s present needs, but being well-informed of various rental yields can certainly help in coming up with a more confident decision when investing on a property. 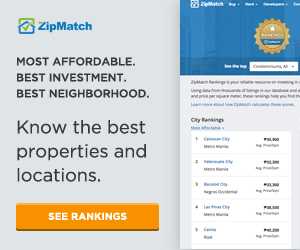 If you’re planning to invest in a condo, townhouse or house and lot within Metro Manila, visit ZipMatch’s rankings page to find and compare rental yields and property prices.